The Spiegelau Craft Beer Glass collection is comprised of three, custom-shaped glasses for the craft beer styles IPA (Indian Pale Ale), Stout and American Wheat Beer. 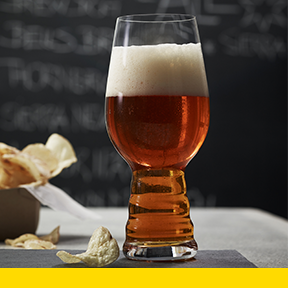 Expertly crafted, tested and approved, the unique shape of each Spiegelau craft beer glass has been developed through a series of design and tasting workshops in collaboration with master brewers of leading American Craft Beer Breweries. Each glass successfully delivers the complexity of aromas of craft beers to the nose, while demonstrating the optimum beer texture, balance and flavor intensity on the palate.